The traction of the Adidas D Rose 5 Boost is admired by many reviewers. The shoe’s durability is said to be for both indoor and outdoor games. A lot of purchasers agree that the SprintWeb technology in the upper works because it helps wick away moisture from the feet. The Adidas D Rose 5 Boost is true to size. It has the same fit as the Nike basketball shoes of Kyrie Irving. The shoe’s stability, which probably is because of the TPU material used on the heel counter, is a favorite of most shoe owners. The bounciness provided by the midsole is adored by many users. It reacts well to any type of footwork. The responsiveness of the Boost cushioning is proven effective by the current owners of the highly anticipated third Adidas James Harden sneakers. Some buyers leave comments that the upper of the shoe is still uncomfortably stiff even after breaking it in. This takes users back to the high-top HOVR Havoc of Under Armour. A number of users complain about the durability of the shoelaces. According to them, the laces start to crumble after a couple of months of use. These basketball shoes from Adidas lack arch support, according to a few owners. Several purchasers notice that the material in the upper creases and scratches easily. If you are looking for a new pair of basketball sneakers that can last more than just one season, the Adidas D Rose 5 is your best bet. It is in the moderate price range yet packed with technologies Adidas can offer. Aside from being durable, the support is more than what you can expect from the more expensive ones. It will also not fail aesthetically. A shoe could have everything I’d want, but if I cannot wear them comfortably then I just can’t get down with them. Disappointed isn’t the word I would use to describe the Rose 5, but it wasn’t exactly what I was expecting. Once these start hitting outlets I will be picking up several more pairs as they have crept into my elusive top 5 rotation of all time. The Adidas D Rose 5 is a signature basketball sneaker packed with technologies to achieve excellent court performance. The Boost technology in the midsole provides firm stability. The outsole has the herringbone traction. It provides a great stopping ability on any court. The heel counter has the SprintFrame technology for a secure lockdown. The breathability is with the help of the SprintWeb technology in the upper. Cushion. Generally, Boost technology is a midsole foam for linear footwork like running. However, Adidas did a great job in modifying the Boost material in the D Rose 5. It is applied as a full-length firm cushion that provides excellent responsiveness, durability, and stability. Traction. The traction of the Adidas D Rose 5 comes from the unbeatable wavy herringbone pattern. The outsole is made of a non-marking rubber compound. It is soft and pliable. It does not accumulate dust, which results in no slippage or injuries to the athlete. This kind of outsole provides a good grip on courts. Length and Width. The length and width of the Adidas D Rose 5 Boost are in standard measurements, as attested by a good number of reviewers. However, there are buyers who mention that the shoe runs long and narrow. It is best to try the shoe in the store before purchasing. Lockdown. The traditional lacing system of the shoe uses flat shoelaces. But the overall lockdown of the shoe is with the help of the SprintFrame technology. It is the thermoplastic polyurethane material installed in the heel counter. It secures the heel properly in order for the foot to have proper containment. It also helps avoid injuries from ankle rolls. 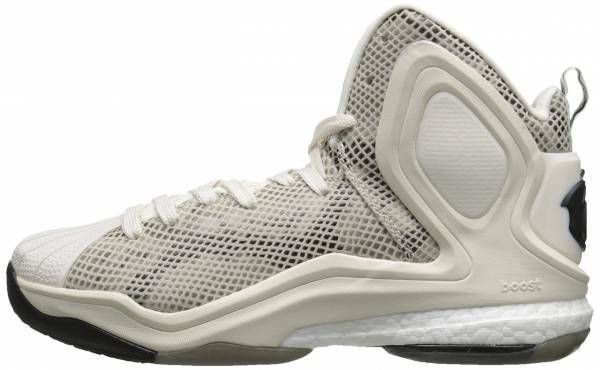 The materials used on the upper of the Adidas D Rose 5 Boost vary depending on the colorway. The upper of the Brenda/L-Train colorway, for example, consists of synthetic leather and mesh. Added to that is the SprintWeb technology in between. It is a weave of minimalistic and lightweight fabrics, and it provides durability and breathability. The insole of the D Rose 5 Boost is made of polyurethane. It is designed to be a little thin for a better court feel. If more cushion is desired, the insole can be removed and be replaced by a thicker one. The mid-top design of the Adidas D Rose 5 Boost provides ankle support to the player. The tongue and the medial side have the adidas callout and logo. To showcase the technology in the midsole, a boost callout is printed on the lateral side. Rose’s jersey number 1 is in the forefoot area. To signify its being Rose’s signature shoe, the Derrick Rose logo and the MMXIV MMXV callout is on the heel counter. On the heel part of the outsole lies the famous stripes of Adidas. On the forefoot part of the outsole is Derrick Rose’s signature.